Bees exist in the wild without assistance from beekeepers. 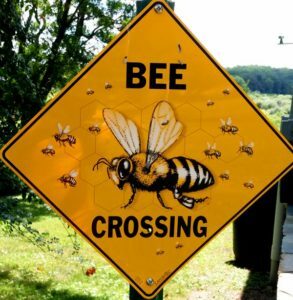 As beekeepers, we provide a healthy environment, food and water when necessary, and protection from pests and predators, so that our bees can produce the honey and beeswax they need to thrive. The mission of the first year beekeeper, or the keeper of any new hive, is to grow bees. A new hive needs to produce enough bees and honey stores to survive its first winter. That means the hive must contain a basketball size cluster of bees and about 90 pounds of honey. The size of the cluster is essential to maintaining the required temperature of 93 degrees at the center when the queen begins laying eggs in midwinter. If there aren’t enough bees or enough food, the colony won’t survive. Honey stores are important as the bees’ primary energy source but beekeepers can provide supplemental food if the stores are inadequate. This year, we’re in the business of raising bees. If we’re lucky, we’ll harvest some honey next year. Several days after installing the bees in the hives, we inspected them to make sure the queen was present and laying and the bees were drawing comb on the foundation. When we purchased our package and nuc we requested marked queens. A marked queen has a small brightly colored dot on her back making her much easier to find among thousands of busy bees. 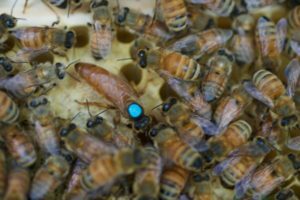 One of our hives has a queen with a bright pink dot and the other with a turquoise blue dot. We usually inspected our hives in the middle of the day when many bees are out foraging. On the first inspection of each hive, we removed the top and inner cover of the brood box and then each frame, one at a time. 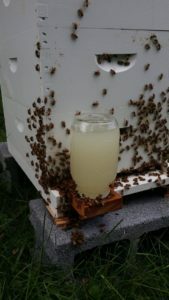 We were able to find the queen in both hives and see that she was laying and the colony was drawing comb on the frames. All was well. 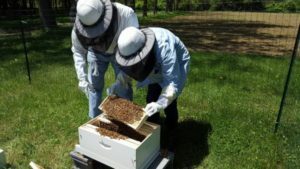 What I found most interesting is that we can open the hives, pull individual frames, even remove an entire box and the bees pay no attention. They continue their work almost as if we’re not there. We’ve never had to use our smoker and prefer not to use it. It’s said that smoke calms the bees but the reality is that the bees perceive the smoke as a forest fire and focus on consuming their honey stores so they can carry it with them to safety. While there may be situations where smoke would be helpful, it seems counterproductive and unnecessary for routine hive care. As the bees were able to find enough nectar and pollen, we discontinued the feeding we started earlier in the spring and removed the Boardman feeder. After several weeks, the bees nearly filled the original brood box so we added a second box to each hive. 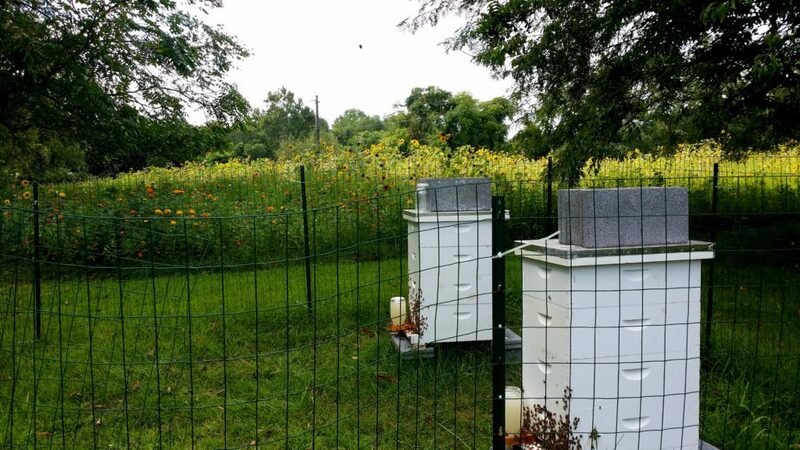 In late July, the second boxes were full with brood in the center and honey stores at the edges so we added a third box to each hive. Although we continued to inspect the hives every week, we no longer examined every frame or worried about finding the queen each time. If we saw active bees around the hive and drawn comb, brood cells and honey stores where they should be after sampling a few frames, we were confident that all was well. No need to disturb the hive any further. 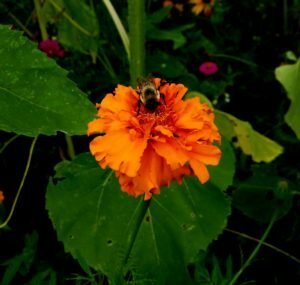 We had some hot weather this summer and the bees definitely felt it. On some of the hottest days, the entire front of the hive was covered with bees. Hanging out on the “front porch” is the bees’ way of cooling themselves and the hive. Bees hanging out at the hive entrance are fanning the hive to increase air flow and ventilation. At this point a water source is very important. If there is no nearby water source, water can be provided with a Boardman feeder (a mason jar with small holes in the lid inverted and fitted into a wooden holder at the entrance of the hive). If entrance restrictors are in place to help bees defend the hive against invaders, they should be removed to improve airflow. If the hive has a solid bottom board it should be replaced with a screen bottom. If necessary, shade can be provided with a pop-up awning. Our bees have shade from trees for the hottest part of the afternoon which did seem to help. We certainly appreciated the shade when inspecting the hives because long pants, long sleeves, beekeeping gloves, hats and veils can be uncomfortable on a hot summer afternoon. By mid to late July the nectar flow was low and we saw that honey production had decreased so we resumed feeding a one-to-one mixture of sugar water and a small amount of vitamins and essential oils with the Boardman feeder (the same as for providing water but containing an appropriate concentration of syrup) and saw increased honey production in the honey super (third box). This will be the bees’ winter food supply. Some bee keepers don’t use this type of feeder because it can encourage “robbing” by bees from other hives but we haven’t seen any robbing activity so far. 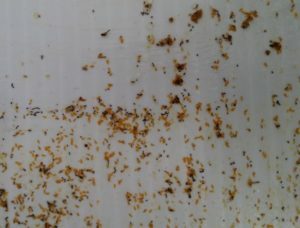 Around this time, a few local bee keepers reported large numbers of Varroa Mites in their hives. Even though we had treated the hives in the spring, we decided to do a 24 hour mite count on each hive. We waited for a day that would be a little cooler and inserted a foam board coated with Vaseline to make it sticky at the bottom of each hive. The board reduces ventilation in the hive so waiting for a cool day puts less stress on the bees. After 24 hours we removed the boards and counted the number of mites on each. We found only one or two mites so there was no need to treat the hives. Since we’re not harvesting honey this year, we can treat with Apivar which doesn’t harm the bees and is very effective. There are other non-chemical methods of mite control, including sifting powdered sugar into the hives to coat the bees. The sugar causes the bees to groom themselves and remove the mites along with the sugar. While many beekeepers swear by the sugar method, it does require ongoing treatments and should be started before there is a significant mite infestation. The bees were very active in August and filled the third box on each hive with honey so we added a fourth box to each hive. We also started feeding pollen patties that we make ourselves. We no longer inspected individual frames but simply opened the top of the hive to peek in and see how much comb and honey there was in the upper box and to add the food patties. The hives sounded wonderful, activity around them was energetic with bees flying off and returning loaded with pollen, and there were already good honey stores. We did another mite check and again found only two or three mites so decided to hold off on treatment. All was well at the end of August. We made it through the summer with healthy hives. I’ve been fascinated by bee behavior both in and out of the hives. I’ve enjoyed watching them leaving and returning. I can only follow them a short distance before they disappear into the background of our pines. I wish I could follow to see where they forage. We’ve become much more confident in handling the frames and feeders so hive care has become much more fun and less stressful. 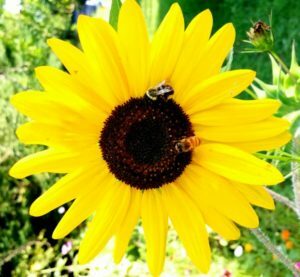 I’m sure all Virginia Master Naturalists are aware that pollinators need our help. Loudoun County is one of the fasted growing regions in the country but this growth comes at a price. 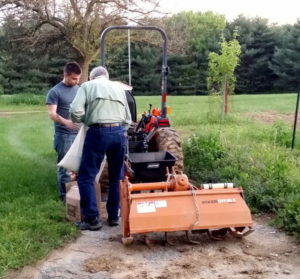 Much of the farmland, open fields and forests in the eastern part of the county have been overtaken by urban and commercial development that replaces green space with concrete. Even in suburban neighborhoods, native grasses have been replaced by manicured lawns. Native trees and wildflowers have been replaced by exotic varieties. Non-native invasive plants are rampant along roadways and other areas disturbed by development. The result is a landscape that’s inhospitable to our native wildlife, including the pollinators. There are several excellent programs that provide education and support for removing invasive plants and replacing them with natives. 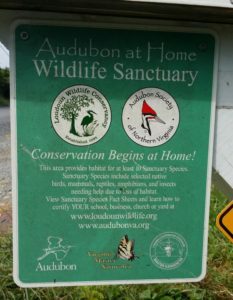 Soon after we moved to Philomont, we contacted Audubon at Home (http://audubonva.org/audubon-at-home-1/). This wonderful organization brought experienced naturalists to our property to help us identify plant species and make an improvement plan. Although we still have some work to do we met the criteria for certification as a Wildlife Sanctuary. I also completed an online course on Woodland Options for Landowners through the Virginia Tech College of Natural Resources and Environment (http://forestupdate.frec.vt.edu/ ) that helped me better understand how to manage my wooded acres. 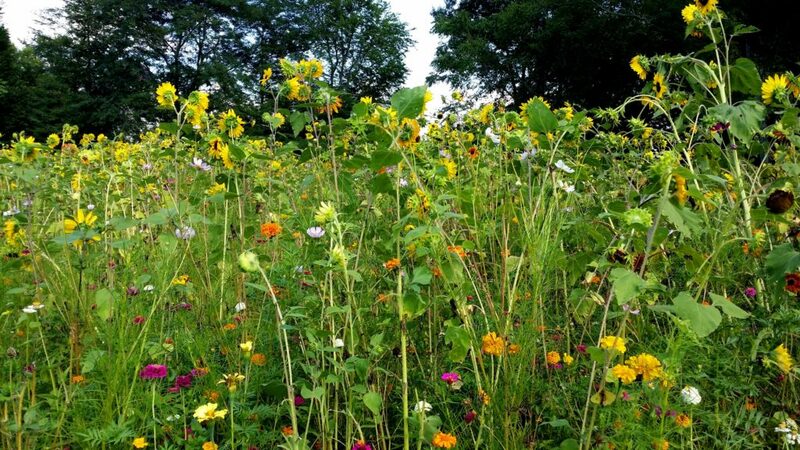 But, as a beekeeper, I still wanted to do something for pollinators so we decided to create a meadow. We selected a grassy area of almost 1/3 acre along the road at the entrance to our property. It’s close to the bee hives and gets sun most of the day. There are natural ways to go from grass to meadow gradually over a period of years but we wanted to do it more quickly. We decided to seed the area with native flowers and began investigating sources for the seed. 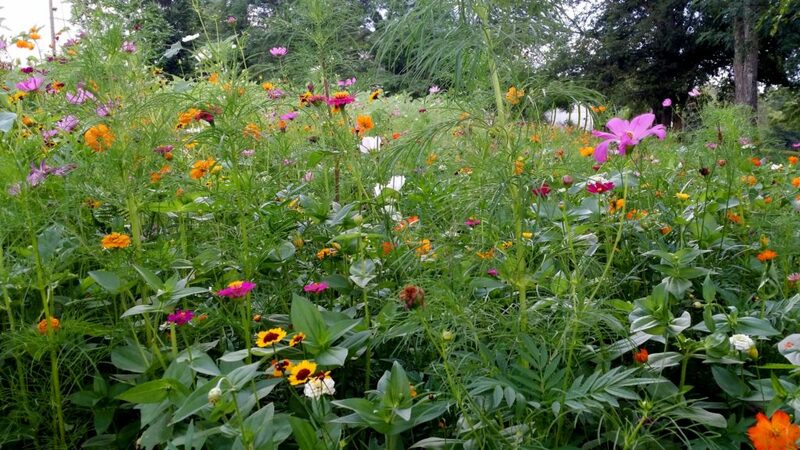 We settled on a bee friendly pollinator mix of annuals and perennials from American Meadows (http://www.americanmeadows.com/ ) but there are many other options depending on your soil type, amount of sun, amount of water, and the type of wildlife you want to attract. The people at American Meadows were very helpful in making recommendations about how much seed we would need and how and when to plant. All seeds from American Meadows are Non-GMO and Neonicotinoid-Free. 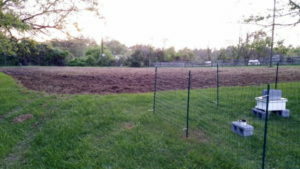 We ordered the seed in March and got to work on preparing the land. We borrowed a tiller attachment for our tractor from our beekeeping mentor. That meant driving our tractor with the attachment on Snickersville Turnpike. Fortunately, we didn’t have to go very far. We used the tiller to turn the soil just a few inches deep. It wasn’t necessary to kill or remove the grass. When the nights were warm enough to be sure there wouldn’t be a frost, we attached a small seed spreader to the tractor and spread the seed as evenly as possible. The spreader was too light to work properly so we enlisted our son to sit on it for extra weight. After seeding, we drove the tractor over the area to push the seed into the soil. Then we waited. I was worried that birds would eat all the seed. I was worried that invasive species would take over in the disturbed earth before the seeds had a chance to germinate. I was worried that the grass would overwhelm the flowers. None of that happened. After a few weeks we started to see little seedlings popping up everywhere and growing quickly. The result has been a beautiful and ever-changing display, from tiny white flowers in the spring to magnificent sunflowers in August. This little 1/3 of an acre is buzzing with bees (not always our bees), butterflies and, a surprise to me, dozens of goldfinches. We’ve had lots of compliments from our neighbors. Some have even stopped to take pictures, one neighbor brings her children every few days to pick flowers, and a few high school students used it as the backdrop for their senior pictures. 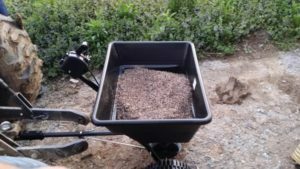 This was easy to do and maintenance free – no watering or regular mowing. It supports our wildlife and is beautiful to look at. Next year we’ll expand this meadow a bit and do the same in some of the shady areas. The people who owned this property before us called a small, secluded, clearing in the pines “The Secret Garden”. By next summer, “The Secret Garden” will be full of flowers.